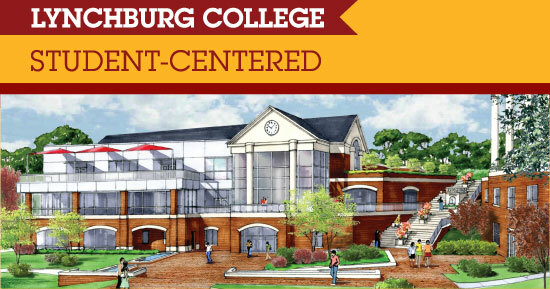 The College will break ground on a $12 million expansion and renovation to its Student Center at 5 p.m. Saturday, April 27. Construction will begin soon after commencement on May 18 and the building should be ready by fall 2014. Brief remarks will be made with music by the LC Pep Band and LC Celtic Ensemble at the groundbreaking, which is being held during Westover Alumni Society Weekend. The existing structure is about 42,000 square feet. The footprint will be expanded by 30,000 square feet for a total of 72,000 square feet. About 8,000 square feet in the existing building will be completely renovated.Dominion 7 Architects, PLC, is the architect andJ.E. Jamerson & Sons, Inc. is the general contractor. Check out this preview of the groundbreaking on WSET. Students have consistently said that renovating the existing student center, built in 1968, is at the top of their capital improvement wish list. President Kenneth R. Garren has focused much of his time and energy on building a new student center. A group of students met with Lynchburg Dominion 7 four years ago to share ideas about a student-centered gathering space. “Our guiding question was: Is the space directly related to student use and does it support leadership, community service, diversity, and wellness?” said John Eccles, vice president and dean for student development. Denise McDonald, vice president for advancement, said $5.6 million has been raised so far. “We are extremely grateful for the support from all our donors and are working hard to make this student center a reality,” she said. The College has met two matching grants that added a boost to the fundraising effort. The Mary Morton Parsons Foundation, on May 9, 2012, challenged the College to raise $200,000 to earn a $100,000 grant, which LC met almost one year before the May 2013 deadline. The Cabell Foundation also issued a two-to-one challenge of $200,000, which the College matched with $400,000. The existing building was completed in 1968 when LC had about 1,000 students. Today, enrollment stands at 2,800. An improved student center is a critical recruitment tool; almost all colleges and universities have impressive new facilities that give them a competitive edge. Eighty-three percent of LC students live on campus, and along with commuters, they need a place where they can engage in numerous extracurricular activities. More than 100 clubs and organizations, many of which provide volunteer service, lack adequate meeting space. LC hosts more than 50 outside community groups per year in the student center, which has no elevator. A fitness center, dance and aerobics space, and game room will allow improved opportunities for exercise and recreation. Dining services will have more room and more venues to continue serving great food. More information can be found on the College’s website.